Our goal at the Arizona Center for Breast Surgery is to make your experiences pleasant, informative, helpful and stress-free. To serve you best, we provide complimentary consultations, flexible scheduling, several financing options, access to top surgical facilities and try to make it as affordable as possible. We have two office locations for your convenience that can easily be reached from most locations in the Greater Phoenix Metropolitan area. 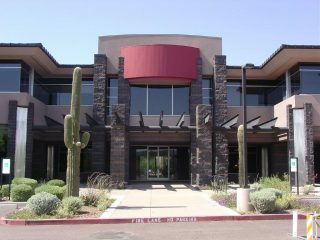 Our main office is located in North Scottsdale at 8502 E. Princess Drive, Suite 240. This is situated on the northeast corner of E. Princess Dr. and N. Perimeter Dr., one quarter mile west of the Loop 101. Other options to reach us include the Hayden Rd. and Bell Rd. exits off the Loop 101 as well as by the Greenway-Hayden Loop. Our Glendale office is situated in the Arrowhead Commons complex at 18275 N. 59th Ave. in Bldg. E Suite 126. This is on the east side of 59th Ave. just south of Union Hills Ave. and the shopping center. We are accessible from a variety of routes including the 59th Ave. exit off the Loop 101 (then head south), Union Hills Ave. and 59th Ave.
Our Scottsdale office is open from 8:00 a.m. to 5:00 p.m., Monday through Friday. The Glendale office is open Tuesday and Friday mornings. We will make every effort to accommodate you in scheduling an appointment and to minimize your waiting time. Your consultation will be with Dr. Turkeltaub rather than with a nurse, medical assistant, marketer or other employee – a practice which is very common elsewhere. We do things this way because he strongly feels that you need to be provided with accurate, appropriate, thorough and up to date information that will serve as the foundation for you to make a well-informed decision regarding your contemplated plastic surgery – and who better to provide it to you than your plastic surgeon. Dr. Turkeltaub is firmly committed to providing you with detailed information for each surgical procedure that you are considering including risks, known complications, expectations, and alternatives. Furthermore, he will not hesitate to advise against plastic surgery or a particular procedure if that is the most prudent choice. Additional information and pictures are available that can help explain and illustrate many procedures in an understandable fashion. We strongly respect your privacy and are fully HIPAA compliant which means that your medical records are treated as confidential information. At the Arizona Center for Breast Surgery we aim to provide you the best possible care at affordable prices. We offer consultations with Dr. Turkeltaub for a nominal fee that is paid in advance and which can also be applied to the cost of your plastic surgery if you elect to proceed. As part of the consultation, you will be provided with an estimate for the expected costs of your surgery (if relevant). Payment for your procedure can be made by cash, cashier’s check, VISA, MasterCard, American Express and Discover. Financing options are also available including with CareCredit. If you are interested in financing your cosmetic surgery, we do have several options available including CareCredit. An application can be completed at the time of your consultation or at anytime by applying online from our Plastic Surgery Financing page. Cosmetic surgery is not covered by insurance but many reconstructive procedures are such as Breast Reconstruction. Breast Reduction coverage varies widely and approval often depends on meeting several criteria. We are providers for many insurance plans. Once you have made a decision to proceed with your surgery, we will make the arrangements and provide you with thorough instructions and answers to all of your questions. We want to make all your experiences as pleasant, positive, convenient and stress-free as possible. Dr. Turkeltaub performs plastic surgery procedures in a few hospital affiliated outpatient centers in the Greater Phoenix area. These facilities are certified, safe, comfortable, and very well attuned to your special needs. Overnight stays with 24-hour nursing care are available at Piper Surgery Center which is part of HonorHealth Scottsdale Shea Medical Center. Our Scottsdale office has a surgical facility where a variety of minor cosmetic and reconstructive procedures can be performed in a comfortable, convenient and confidential environment. Most plastic surgery is performed at Piper Surgery Center which is located near our Scottsdale office on the campus of HonorHealth Scottsdale Shea Medical Center. Our preferred surgery center in the west Valley is Banner Del E. Webb Surgery Center. If you would like to schedule a complimentary consultation, please feel free to call us at (480) 451-300 or email through our Contact Us page.